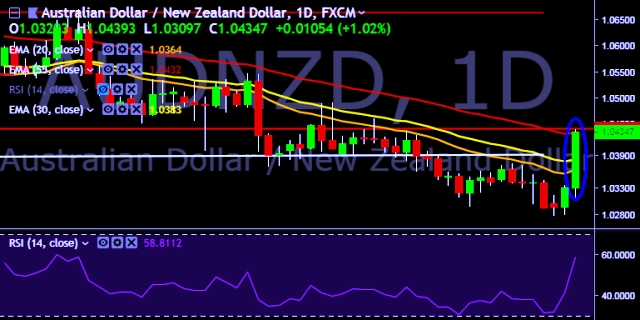 AUD/NZD is currently trading around 1.0435 marks. Pair made intraday high at 1.0444 and low at 1.0309 marks. A sustained close above 1.0364 will drag the parity higher towards key resistances around 1.0428/1.0488/1.0540/1.0570/1.0590/1.0634 levels respectively. Alternatively, a daily close below 1.0329 will take the parity down towards key supports around 1.0275/1.0237/1.0192 marks respectively. New Zealand March cash rate stays flat at 1.75 % (forecast 1.75 %) vs previous 1.75 %. RBNZ - Expect low interest rates, increased govt spending and investment to support growth over 2019.